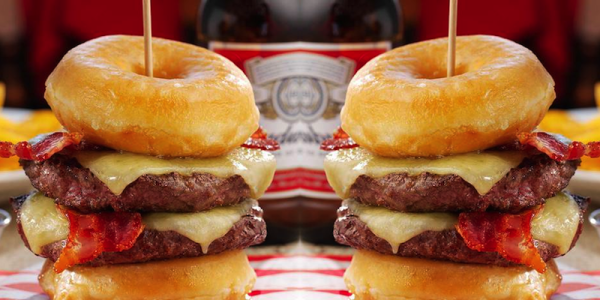 UK’s pub chain Hungry Horse has been criticized for creating the Double Donut burger containing nearly 100% of a woman’s recommended daily calorie intake at 1,996 calories. Critics called it irresponsible, dubbing it “a heart attack on a plate”. Hungry Horse said it was catering for a variety of tastes. Advertised with the tag line “So Wrong It’s Right”, the Double Donut burger contains 53g of saturated fat, well above the 20g daily allowance for women and 30g allowance for men. The amount of salt in it – 8.2g – is also more than the recommended daily amount for adults (6g).